I chose a cheesy army (I was fed up with losing) and I wanted to see how well the Nauticans would stand up to some sustained pummeling ! Next time, I promise we will concentrate more. I was knackered and my mate "J" was hungover ! The full moon shone a pathway across the still ocean waters and the small surf that lapped onto the stony beach. The night was cold and more foggy than usual in the small coastal inlet. A salty mist had swept inland for several miles and dampened the usual night time sounds of the nocturnal creatures or had maybe frightened the owls and foxes away. Hans and Johan were enjoying a stein of beer and the company of the local wenches when their Sergeant entered the Tavern. "Drink up lads and get your backsides into the village square, you've got 5 minutes !" The pair of Empire spearmen emerged into a hive of activity as they left the village tavern. Before them were ranks of halberdiers donning their chainmail and the venerated Greatswords carefully honing their blades with their state issued whetstones. "Oi mates, move yourselves !" shouted a mortar team from the Engineers guild as they rolled their artillery piece across the village green. "what's happening ?" Hans asked a helmed Halberdier sucking on his pipe..
"There's some trouble brewing at the coast 10 miles yonder" replied the halberdier gesturing towards the coast road. "It seems the rumour of some army from the ocean was not a child's fanciful tale afterall" the halberdier muttered under his breath, little believing what he was saying. Hans and Johan had heard the rumours last night from the barman. An army from the sea sounded ridiculous and they assumed the barman must have misheard the outrider scout who's tongue had been loosened by a couple of tankards of Bugman's finest XXXX. The spearmen had assumed it must be another small Dark Elf raiding party that were known to occassionally harry the local fishing villages when richer pickings could not be found elsewhere. One thing was undeniable though, while the sun was shining brightly on their village, an unseasonal mist had descended to the west and rolled ever further inland. It looked like Hans and Johan would soon be able to see for themselves as the call to arms rang out around the village and the Empire forces adopted their marching formations. Note: The Nauticans bring a Chanty Singer and summon a sea storm for forego their opportunity of going first. Warning: I don't have the full notes for this battle and it was a couple of weeks ago now so it gets a fair dose of artistic licence and it's a bit summarised. The Empire hold their line waiting for the army from the Sea. A ferocious bombardment is meted out on the Oceanic Trident Guard. Raining death from above with mortars ably directed by a Master Engineer. Seven Trident Guard fall with sharpnel embedded in their hides. Volkmar looks to the skies and hails the true Gods, his prayers are answered and he becomes unbreakable. As the Battle Wizard invokes the power of the Orb of Thunder preventing the Manta Rays from flying much to the delight of the artillery crews. The rumble of thunder echoes across the skies and a fierce swirling wind lashes rain down upon the artillery in the center of the Empire lines as the Nautican Sea Storm assumes dominion of the skies. The artillery men dive to the ground as electricity dances along the barrels of their gunpowder war machines. With a raised hand the Empire Battle Wizrd dispels the lighning bolt that dissipates into the heavens leaving the Empire forces unharmed and the gunners extremely thankful. As one, the Nautican army moves forward dripping sea water and trailing weeds from the sea. Only the Manta Rays stay in position "flapping" against the ground unable to gain any "purchase" on the waves of magic. The Empire forces continue to hold their lines awaiting the onslaught from these most perculiar creatures. The men were still confident that cold Empire steel would make quick work of these "fishmen". Volkmar inokes the power of the Griffon standard and casts burning gaze against the sandgangers but they are unaffected save they begin to shine as some sand is glazed forming a glass like crust. Four sandgangers are blown apart like a child's sandcastle as a mortar aimed at the Trident Guard falls amongst their ranks. The second mortar is aimed more accurately by the Master Engineer and fells a further two Trident Guard. They are clearly the most fearsome looking enemy on the field of battle and the mortars are ordered to continue firing on them until not a single creature stands. Disaster strikes the helblaster crew as it takes aim on a unit of sandgangers. The third barrel misfires but sends a volley of an extra ten shots at the enemy before the artillery machine blows up. Twenty-eight shots are fired in total and they succeed in blowing eight sandgangers to smithereens. The sandgangers are not phased, indeed the destruction of their comrades is totally meaningless to them. The Battle Wizard once again manages to prevent the Manta Rays from moving with the Orb of Thunder. Planning to fight alongside his forces he successfully casts the Bears Anger on himself. The whole Nautican army continues to move forward, the Coral Hunters eventually come into range and unleash a volley of bolts on the Empire lines but they have little effect, felling only a handful of the Empire spearmen throughout the course of the whole battle. One unit of Coral Hunters flees early on before making any impression on the battle as the Empire Steam tank which has advanced side by side with Volkmar makes steamed fish soup with them. Volkmar becomes embroiled in a combat against a depleted unit of sandgangers that manage to hold him up for the course of the battle as the other Nautican units maneuver to charge. Volkmar receives the charge of the Interceptors, the elite Trident Guard who are tasked with protecting their people from the feared Leviathans. This was not the best use of the Interceptors and despite the fearsome reputation of their javelin throwing charge they were only able to deliver a single wound to Volkmar who continued to be unbreakable. Volkmar also continued to use the Golden Griffon which the enemy was forced to save his dispel dice for allowing the Orb of Thunder to keep his Manta Rays almost permanently "floored". The Steam Tank was held up by Lobstrosities who managed to see off a unit of knights. The Lobstrosities tore at the tanks hull unable to get to the crew or harm the vehicle. Next, the Steam Tank bore the full brunt of a Royal Chariot charge (which luckily did not destroy the chariot itself !) but continued to battle on, although it was seriously damaged by the clash and ultimately doomed through the loss of safely generatable steam points. The Outriders harried the enemy flank throughout the battle and felled several Trident Guard and some Cortal Hunters and remained unscathed at the end of the battle - there was no way the Nauticans could have got to grips with them given their position and the proximity of the Royal Chariots which were the only threat. In the center the Spearmen continued to protect their artillery crew and advanced on the enemy in the later stages with the intention of delivering the killing blow to the Trident Guard. The halberdiers and greatswords had engaged the Interceptors alongside Volkmar and gradually beat them back, only the Interceptor's stubborn demeanor saved them from fleeing. Throughout the whole battle the Mortars rained death down upon the beleagured Oceanic Trident Guard. Coupled with the outriders repeater handguns the trident guard suffered over 20 dead before they were even in a position to engage the Empire forces. Both sandganger units were eventually destroyed but they proved very valuable at holding up Volkmar and one unit almost penetrated the Empire line to launch an attack on "Artillery Hill". The game ended early because we simply ran out of time. I added up the points and despite the hell that the Nauticans had been through it was only a minor Victory to the Empire. I think the Creatures of the Deep special rule for certain units (5+ regen save) helped to keep the Nauticans standing - but only just ! We learnt a lot during this game. The Nauticans were seriously hampered by not having taken a magic user and thus not having enough dispel dice to give them a chance of dispelling both the Golden Griffon and The Orb of Thunder. As a result the 5 Mants Rays were out of the game, a loss of 150 pts and a serious impairment because the Nauticans did not have anything else to threaten "Artillery Hill". A magic user, even just a Siren might have made a difference. Indeed, a Siren on The Eternal Wave would have provided 2 additional dispel dice and the ability for the Siren to add a +1 to combat res and be able to move easily between units and, perhaps, cast the Sea Surge spell to propel the Nautican army into combat sooner. That was the biggest problem my friend faced, getting the Nauticans into combat as quickly as possible while incurring minimal casualties to missile fire and artillery. I think he might choose Crest Riders if we were to play the game again. Positioned behind a unit of sandgangers they would be fairly well protected from missile fire (except anything on a hill) and once within range could ride their wave 20" into combat against the artillery crew. Even if they were targetted by the artillery fire before hand, with their General in close proximity they probably wouldn't have panicked and, even if they did, they would have diverted some mortar fire from their essential Trudent Guard unit. One other error was using the Interceptors to charge against the Arch Lector. They were not going to be able to rout him (he was unbreakable at the time) and due to all his saves they probably were not going to kill him. The Interceptors come into their own against rank and file, denying them their rank bonus and causing mayhem when they charge with javelins (the wounds get added to the combat res in the first round) and might have been better deployed against my greatswords. That said, he was a bit enclosed and there was little room for movement so he might have felt it better to take the initiative rather than wait another turn moving out of the way of the chariot and Wavebreakers. There was one last thing, the 3 Royal Chariots (which came as a big suprise to me) were an attempt to get into combat quickly and provide some much needed punch on the charge. However, they were positioned behind the lines and entered the fray too late into the game. One chariot did not get to charge at all and was a waste of points (it contained a "tooled up" Nautican Prince). So, the real lesson against the Empire was the importance of closing the gap over "no-mans land" and getting to grips with the enemy at the soonest chance. The Creatures of the Shore rule would have helped (certain units can be deployed 6" further into the battlefield - if we had remembered to use it !) and so might a unit of Crest Riders. 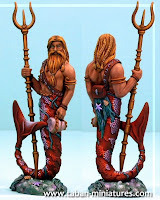 Also, at this stage I'm feeling that spellcasters need to be integral for the Nautican army and are almost a "must" choice given some of their benefits over and above some other magic users. Well that's it, apologies I did not have full details of the remainder of the battle and sorry to "J" if I have missed anything out or misrepresented anything. I should have written this straight after the battle. Edit: 13th June 09 - I forgot to mention that the Chanty Singer worked quite well. The Sea Storm prevented 2 mortar shots from firing (due to wet gunpowder) and he also managed to prevent the Interceptor unit from fleeing due to his song "echoes of mighty glories". Also, the timing was spot on, when the Sea Storm stopped (at the end of turn 3) the bulk of the Nautican units had just become engaged in combat and so were able to benefit from the Chanty Singers songs which previously could not be heard above the storm. One last thing, I'm happy to report that my opponent believes we now have a workable and balanced army.